CM Magazine: Jasper John Dooley NOT in Love. (Jasper John Dooley 3). Caroline Adderson. Illustrated by Ben Clanton. Toronto, ON: Kids Can Press, 2014. After lunch, Ms. Tosh asked everybody to get together with their reading buddies. Jasper and Ori were reading buddies. They were reading buddies, knights, friends and neighbours. Ori lived across the alley and one house down from Jasper. Before anybody else could, Jasper and Ori dove into the Book Nook at the back of the classroom and stretched out on the cozy pillows. "You read first," Ori said. Jasper grabbed a book. But instead of reading out loud to Ori, he started chewing on the book. "I'm still a bad baby," he told Ori. "And I eat books." Leon, who wasn't dead anymore, turned around at his table. When he saw Jasper eating his book, he laughed and pointed so that everybody in the class turned to look. Ms. Tosh didn't laugh. She said, "Ori, go read with Zoë. Jasper, you read with Isabel." She said it in a way that made both boys obey her right away. "Just for today, right?" Jasper said. "Until I say so," Ms. Tosh said. At least Jasper got to stay in the cozy Book Nook. Isabel came over and plopped down on the pillow beside him with her legs stretched out. She was a very freckly girl. She even had freckles on her legs. "You read first, Jasper John," she said, smiling and showing the no-teeth space in her mouth. Jasper's book was about a dog that could skateboard. As soon as he started reading, he was interested. Isabel was interested, too. Jasper knew she was interested because as he read, Isabel leaned in close to him. She leaned so close Jasper could smell her. She smelled like strawberries. "Yuck!" Jasper roared when he felt Isabel's wet tongue on his cheek. "Yuck!" And Ms. Tosh said, "Jasper John Dooley! You've disrupted us enough for one day!" During recess at school, Jasper John, Ori, and Leon like to play knights and dragons, but, when the boys agree to play with Isabel and Zoë in exchange for sweets, the girls make them pretend to be babies. Jasper John has no interest in an after-school play date at Isabel's house. He thinks that "All girls do is stay inside and brush their hair." Nevertheless, Mom arranges the play date. Jasper John is surprised to learn that Isabel gets to eat jam straight out of the jar. Plus, she has a drum set in her bedroom and a trampoline in her back yard. He loves the "flip-floppy feeling in his stomach" while jumping on the trampoline and doesn't want to leave when Mom comes to pick him up. On the way home, he tells Mom all the things he doesn't like about Isabel, including the fact that she shares a spoon with her dog. While jumping on the trampoline during their second play date, Isabel asks Jasper John to marry her. After he explains he's promised to marry Mom, Isabel informs him that she's already told everybody - including the school principal - their big news. Jasper John feels sick about it, but Isabel teaches him how to do summersaults in mid-air, and it's hard for Mom to get him off the trampoline to go home. 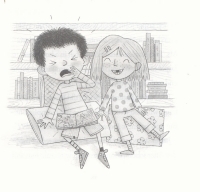 During a play date at Jasper's house, Isabel suggests he play connect-the-dots with her freckles, and they both have fun as Jasper John creates animals, boats, rocket ships, and more on Isabel's face, arms, and legs. Still, Jasper is desperate to get out of marrying Isabel, but nothing he tries - from ignoring her, to being overly nice, to dipping her hair in jam - stops her loving him. Then, at lunch one day, Isabel sees him share a spoon with Ori. She screams and says she thinks she's going to throw up. And with that, Jasper John is freed from marriage. Isabel is bright, fun-loving, and full of energy. Jasper John is resourceful, thoughtful, and imaginative. He gleans advice on girls from Mom, Dad, and Gran - all credibly sketched - but is continuously surprised by Isabel and, ultimately, has to count on his own wits to keep situations from spiralling out of control. For instance, when Isabel wants to wrestle and she "sits on his back and bounces up and down, making the air pfft-pfft-pfft out of him and not come back in", and Jasper knows that he "couldn't - pfft-pfft-pfft! - be nice to Isabel until her nanny picked her up [because he'd] be dead by then", he decides to imitate their teacher: "'Isabel!' Jasper said. 'You've disrupted us enough for one day!' And Isabel stopped." Ori feels left out when his good friend goes to play at Isabel's. And the next day - even though he doesn't like playing baby - when Isabel and Zoë both want Jasper to be their baby and neither girl wants him, Ori discovers that he dislikes being ignored even more than he dislikes their game. Before Jasper's second visit to Isabel's house, Ori says, "Come to my house, Jasper John. I'm your friend. I'm your close friend. Doesn't she live five streets away?" When Jasper doesn't have time to play with Ori and Leon because Mom has invited Isabel to his house for a play date, the boys befriend Paul, a new boy, to play knights with them. But, by the end of the story, Jasper John and Ori are once again reading buddies, knights, closest friends and neighbours. 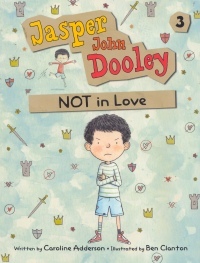 Jasper John Dooley NOT in Love is an excellently written and humorous read-aloud chapter book for young children. They will be surprised and delighted by the story's wonderfully perfect, character-driven plot twists. Through the thoroughly engaging dialogue and actions of Jasper John, Isabel, Ori, Mom, Dad, Gran, and Paul, the author touches convincingly on various social issues from gender stereotyping to respect, jealousy, and exclusion. Jasper John Dooley NOT in Love is author Caroline Adderson's third and best (as yet) in the "Jasper John Dooley" series. Karen Rankin is a Toronto, ON, teacher and writer of children's stories.